On a sunny day Paradise, WA is exactly what the name promises – a paradise of flowery meadows and never-ending views including those of several major volcanoes in Washington State. 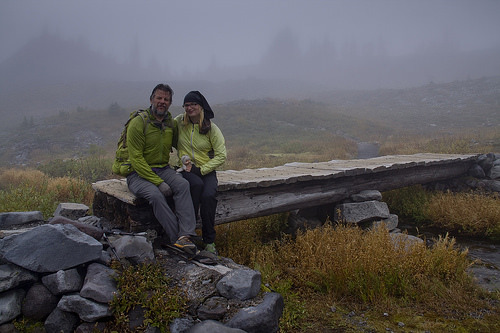 Variety of trails start here, from wheelchair accessible paved walk through the paradise meadows to a physically demanding hike to Camp Muir which is the base camp for those attempting to climb to the summit of Mount Rainier via the popular DC or Ingraham Glacier routes. But let’s be realistic. 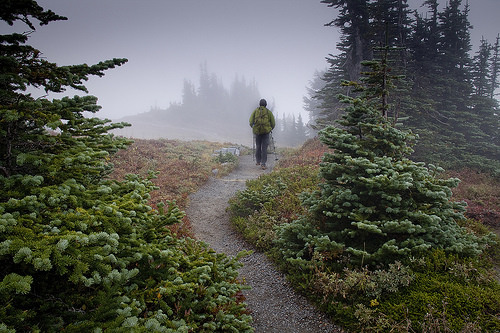 We are talking about a high altitude destination in the Pacific Northwest here, place where it rains frequently, where the wind howls daily and where fog often obscures the views so that you see nothing but the dirt in front of your feet. If you find yourself in Paradise on a day that is less than stellar, you surely can turn and come another time, or you can embrace the fog as a part of the adventure. We did and we thoroughly enjoyed our hike. Usually Mount Adams can be seen from here. 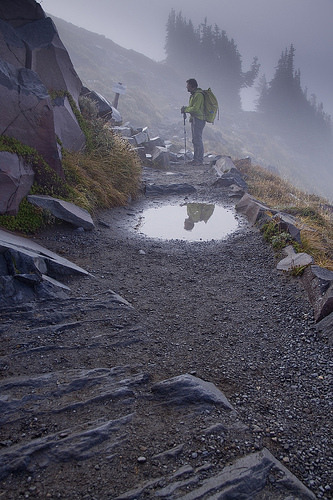 Skyline Trail is a 5.5 mile long loop that departs from a trailhead behind Jackson Visitor Center. The initial half mile is steep but afterwards the trail eases into more forgiving grade. The first landmark on the trail is Glacier Vista which offers great photo opportunities if the views are present. Afterwards the trail moves towards Panorama Point. Looking south, you can see as Oregon’s Mt. Hood from here on a clear day. Closer you can admire Mt. St. Helens and Mt. Adams and closer yet your eyes can feast on the beauty of Tatoosh Range. From Panorama Point you have a choice of two routes. The lower one is a steep snow covered slope. If you don’t feel you can cross it safely, the alternate high route is usually snow free and provides much better footing. In half mile the two routes join again. Another half mile further you will encounter intersection with the Golden Gate Trail, your opportunity to return back to Paradise earlier. If you take it, you will shave about a mile off your trip but you will miss the serene Sluiskin Falls and Stevens Van Trump Historic Monument, which commemorates the first documented ascent of Mount Rainier by P.B. Van Trump and General Hazard Stevens in 1870. The views of the mountain from this vantage point are alone well worth the extra mile. Skyline Loop Leading to Van Trump Monument. The last decision you will have to make comes in 0.4 miles past the monument where your last intersection awaits. 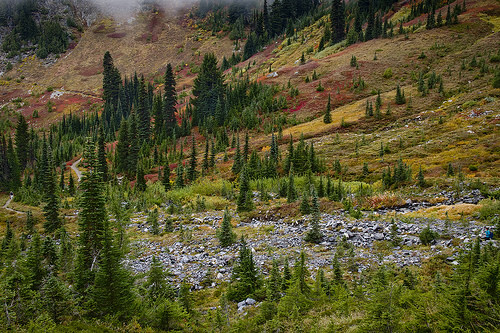 The Skyline Loop continues west towards Myrtle Falls and Edith Creek Basin which is especially beautiful when dressed in autumnal hues. If you wish to extend your hike, take the Lake Trail turnoff which is a 4 mile detour around beautiful Louise and Reflection Lakes. When fog obscures the vistas, closer views have their opportunity to shine. Drive south on I-5 to SR 512 (exit 127). East on SR 512 to SR 7. South on SR 7 to SR 706 in Elbe. East on SR 706 through Ashford to the Nisqually Entrance. Beautiful images. Looks like a great hike. Sure you might miss out on the mountain views on foggy days, but I still find them beautiful just in a different way. 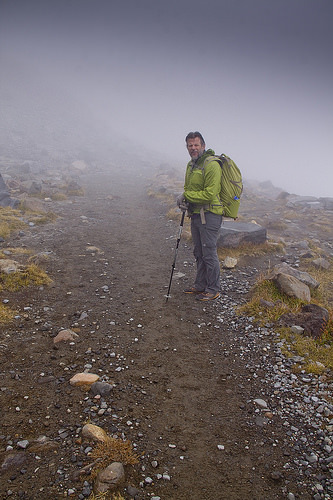 And even better – you have a higher likelihood of having the trail all to your self! Lovely photos, awesome colours!